kodesh (קֹדֶשׁ) = holiness; a holy thing, person, place, or day. lekadsho (לְקַדְּשׁוֹ) = to make him holy, to consecrate him. kavod (כָּבוֹד) = honor, magnificence. tifaret (תִּפְאָרֶת) = beauty, magnificence. In this week’s Torah portion, Tetzavveh (“you shall command”), God tells Moses how to set up the institution of priesthood for the Israelites’ new religion. Before giving instructions on how to ordain Aaron and his sons, God describes their costumes. These are not merely fine clothes, but holy garments. In the Torah, something is holy when it is set apart for the worship of God. Priests must wear their vestments whenever they are on duty, and only when they are on duty. The passage translated above says that Aaron’s holy garments will make him holy, too. Even if his heart were completely dedicated, he would not be holy without the garments. Aaron, as high priest, must also wear these garments for kavod and tifaret. I can understand why special clothing confers honor; it indicates the wearer’s authority. In our society, doctors wear white lab coats, police officers wear uniforms and badges, and rabbis wear caps (kippot or yarmulkes) and prayer shawls (tallitot)—at least when they are on duty. 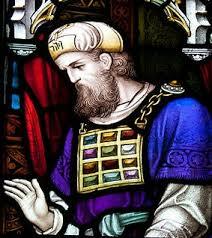 But the high priest of the Israelites must also wear special clothing for tifaret, for beauty or magnificence. Both meanings of tifaret apply to the vestments of the high priest; they are beautiful to behold, and they make the priest look so magnificent that the beholder assumes he is a superior being. The high priest and his assistant priests wear the same first two layers of clothing: undyed linen breeches (underpants), and long linen tunics over the breeches. The high priest wears a sky-blue robe over his tunic. 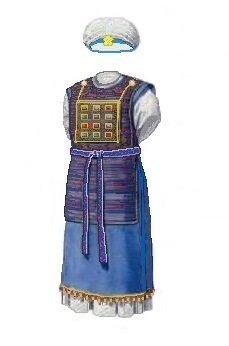 All the priests wear the same sash to hold their tunics (and for the high priest, his robe) together at the waist: a strip of linen embroidered with sky-blue, purple, and crimson wool, just like the curtains hanging at the doorways into the outer courtyard and the sanctuary of the mikdash (“holy place”). (See my post Terumah: Under Cover.) And all the priests wear turbans wound around their heads, though the high priest’s turban is a different shape. Modern commentator Avivah Gottlieb Zornberg wrote in The Particulars of Rapture that the appearance of the high priest is all-important; the man merely animates the glorious costume as it carries out the rituals in the courtyard and the sanctuary. She also pointed out the double meaning of the Hebrew word for “garments”. Like “a wolf in sheep’s clothing”, a person can deceive others by wearing clothes that do not match his true identity or his inner self. A high priest wearing a dazzling holy costume might have an unworthy personality. Today, people often project their expectations on the person in uniform or the person with the title or degree. Doctors in their white lab coats, with their MD degrees, may or may not be the perfect diagnosticians that patients assume they are. The person who wears a kippa (cap or yarmulke) and a tallit (prayer shawl) as he or she leads services, and has received ordination as a rabbi, may or may not be as saintly as congregants assume. For the high priest of the Israelites, the clothes did make the man. All people needed to do was watch the gorgeously bedecked priest carrying out the ritual of the moment, and the sheer beauty of it inspired them to religious worship. 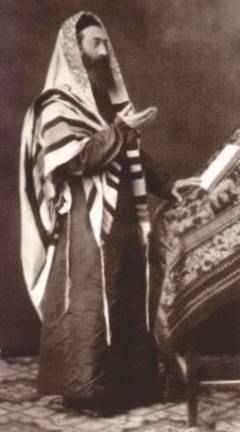 For a congregational rabbi today, the longest and most gorgeous tallit is not enough. The rabbi must also inspire congregants with his or her d’var Torah (“word of Torah”, or sermon). And a rabbi today is expected to set an example of ethical behavior, and to provide pastoral counseling. A rabbi’s soul really does matter more than the rabbi’s clothing. This makes a rabbi more like Moses, who wears ordinary clothing as he speaks with God and leads the Israelites. At least his clothing is never mentioned in the Torah, except for the shoes he removes at the burning bush, and the veil he wears after his face acquires an unearthly radiance. The materials or colors of Moses’ shoes and veil are not specified. In the Torah, the religion of the Israelites is established with both Aaron and Moses, and continues with both a high priest to conduct religious rituals and a king and/or prophet to provide guidance. Maybe we need both an Aaron and a Moses today, as well. My own congregation has a number of people who are skilled at leading services. (And we wear the right garments when we do so!) Yet a large number of our congregants want some of our services to be led by an official, ordained rabbi. The title “rabbi” is as reassuring to them as the MD after my doctor’s name is to me. And sometimes an Aaron is not enough; we need inspiration from a Moses, from a person with deep soul, whether or not that person has a title or a uniform. But finding the person with the deep soul is harder. You can’t just look for a man in a blue robe with a gold plate on his forehead.